Labour’s total of 279 is up 21 on its result in 2010. It includes Corby, which the party won in a by-election in 2012, and Bradford West, which I’m increasingly convinced the party will take back from George Galloway. The Conservatives’ total of 271 is down 35 on what they got in 2010, and doesn’t include the seat of the Speaker John Bercow. The Lib Dems are down 30. Plaid’s total of three includes one loss to Labour (Arfon) but one gain from the Lib Dems (Ceredigion). Caroline Lucas will hold her seat for the Greens in Brighton Pavilion. In Northern Ireland the DUP will gain Belfast East from the Alliance but otherwise there will be no change. Ukip’s three seats are Clacton, Rochester & Strood and Thurrock. I maintain (and may do so to the end!) that Nigel Farage will fail to win Thanet South. 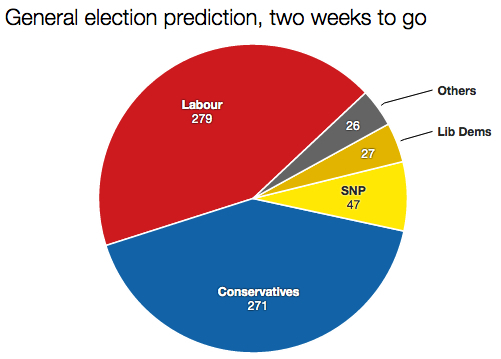 I’m now putting the SNP up on 47, which represents an increase of 41 on 2010. I’ve handed them 10 gains from the Liberal Democrats (including Charles Kennedy’s seat of Ross, Skye & Lochaber), one from the Tories and 30 from Labour. Based on these figures, a Tory-Lib Dem coalition would total only 298: 28 short of the theoretical number needed for an absolute majority in the House of Commons. Add in the DUP and you’d have 307. Labour plus SNP would come to 324; add the SDLP and you’d get 327. The only combination with a comfortable majority would be some kind of deal between Labour, the Lib Dems and the SNP, who between them would have 351. I’ll do another prediction – my last – on 7 May itself. In the meantime, here’s how I calculated the current totals, which are compared with the 2010 general election result. From the Lib Dems: Norwich South, Bradford East, Brent Central, Burnley, Manchester Withington, Birmingham Yardley, Hornsey & Wood Green, Cardiff Central and Redcar. (total = 9). From the Tories: Warwickshire North, Hendon, Cardiff North, Sherwood, Stockton South, Lancaster & Fleetwood, Broxtowe, Amber Valley, Wolverhampton South West, Waveney, Carlisle, Morecambe & Lunesdale, Weaver Vale, Lincoln, Plymouth Sutton & Devonport, Stroud, Bedford, Dewsbury, Warrington South, Pudsey, Enfield North, Northampton North, Brentford & Isleworth, Halesowen & Rowley Regis, Nuneaton, Ipswich, Croydon Central, Ealing Central & Acton, Norwich North, Bury North, City of Chester, Keighley, Corby, Cannock Chase, Wirral West, Hove, Brighton Kemptown, Hastings & Rye, Erewash, Stevenage and Finchley & Golders Green (total = 41). From the Lib Dems: Solihull, Dorset Mid & Poole North, Wells, St Austell & Newquay, Somerton & Frome, Chippenham, Berwick-upon-Tweed, Portsmouth South, Devon North and Taunton Deane. From the Lib Dems: Gordon, Argyll & Bute, Caithness Sutherland & Easter Ross, West Aberdeenshire & Kincardine, Dunbartonshire East, Inverness Nairn Badenoch & Strathspey, Edinburgh West, Fife North East, Berwickshire Roxburgh & Selkirk and Ross Skye & Lochaber (total = 10). From Labour: Ochil & South Perthshire, Inverclyde, Dundee West, Falkirk, Aberdeen North, North Ayrshire & Arran, Airdrie & Shotts, Glasgow East, Livingston, Edinburgh East, Midlothian, Linlithgow & East Falkirk, Glasgow South, Glasgow North, Glasgow Central, Glasgow North West, Dunbartonshire West, Kilmarnock & Loudoun, East Kilbride Strathhaven & Lesmahagow, Lanark & Hamilton East, Glasgow South West, Motherwell & Wishaw, Aberdeen South, Stirling, East Lothian, Edinburgh North & Leith, Central Ayrshire, Ayr, Carrick & Cumnock, Cumbernauld Kilsyth & Kirkintilloch East and Dumfries & Galloway (total = 30). From the Conservatives: Dumfriesshire, Clydesdale & Tweeddale. From the Conservatives: Clacton, Rochester & Strood and Thurrock. From the Lib Dems: Ceredigion. Personally I don’t think Labour will manage to take that many of the Tories. I think with the ways polls have understated tne Tories and overstated Labour throughout this parliament, Labour will not have as much of a swing and percentage of a vote to capture anymore than about 35 seats, which will be balanced out by their losses to the SNP. 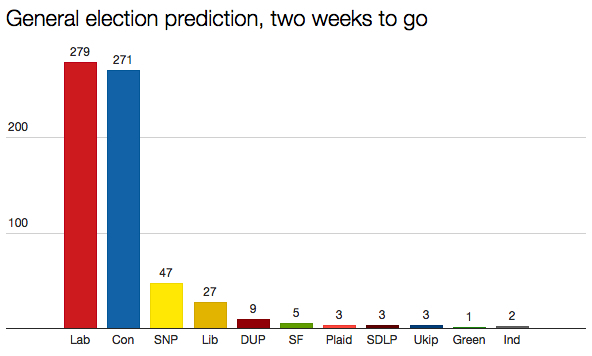 Also I think the Tories will get far more than ten of the Lib Dems- 14 or more. Which additional Lib Dem seats do you think the Tories could win? Which seat was the hardest for you to make up your mind on? I’m still uncertain about places like Hove and Brighton Kemptown, where – although Ashcroft puts Labour ahead – the Greens could yet split the anti-Tory vote. I’ve given them to Labour for now, but could do with some fresh constituency polling! Also, I wonder if the Lib Dems may yet hold on to a couple of seats I’ve assigned to other parties: Birmingham Yardley and Devon North. Very difficult without Ashcroft Poll to predict Bradford W which could go either way. I think LDs should hold Devon N and Berwickshire Roxburgh Selkirk and perhaps Birmingham Yardley and I think will end up with 30 seats. I think UKIP will end up with Clacton Thanet S and possibly Thurrock but lose Rochester&Strood. In Scotland SNP 50 Labour 6 LD2 (BRS and Orkney&Shetland) Con 1 (DGT). I am expecting only about 30 Labour gains from Con. As most of you will know in 2005-2010 parliament Con gained Crewe&Nantwich and Norwich N in by elections and had their GE2010 majorities inflated due to the by election effect. I am expecting Labour to gain Crewe&Nantwich but Con to hold Norwich N as Chloe Smith resigned her ministerial post to concentrate on saving her seat. Does that tally of six Labour seats include East Renfrewshire? I suspect the Conservatives and Lib Dems will do slightly better than the polls predict in England, and Labour slightly worse Contrariwise, I expect Labour will do slightly better and the SNP slightly worse in Scotland. That said, I doubt it will be possible for any group of two or three parties to form a stable coalition, short of a Con-Lab “grand coalition” in the national interest. Will the crisis be enough to trigger a form of national government? I doubt it. Cameron can hang on as PM until it becomes clear that another government would command a majority in the House of Commons. Might we get as far as a minority Conservative (or Lib-Con) government trying to defend a confidence motion? Or the Lib-Con coalition resigning, and a minority Labour government finding itself in a similar position? Would the Lib Dems and SNP vote down a minority Labour government? What bones might a minority Labour party have to throw them to keep them on-side? All in all, an unholy mess, ripe for an unstable minority and probably another general election in 6 to 12 months. Anyone underestimates at his own peril Labour’s efficiency under current constituency boundaries in turning votes into seats in ENGLAND, where they are still no more than a couple of points behind. Remember that Labour won 90 more seats than the Tories in England despite losing the popular vote in 2005, won 160 more seats on a six point lead in 2001, and was only 100 seats behind on an 11 point deficit in 2010. While the (first-term) incumbency effect and the realignment due to the rise of UKIP may reduce such bias, it will still be quite a surprise (I think) if there is a substantial deviation from the trend in the Tories’ favour come May 7. If Labour hold 6, it will include Renfrewshire E but as we get closer to 7 May I may amend my predictions. I agree with you and with psephologist John Curtice about efficiency of Labour vote which will still apply but not to the same extent despite SNP surge. The worst result for the Conservatives would be not only to lose GE2015 on seats but for difference to be under 20 as boundary changes and reduction of seats Which failed to get through Parliament, would have given Conservatives an advantage of about 20 seats (although even in that event there would still have been a Labour “bias” due to differential turnout).